room at New Norfolk High School. THE original buildings of the New Norfolk High School will be gone within a fortnight. Demolition works started last Wednesday, consigning to history several rooms including the lunchroom and the original computer room where students in the 1980s and 90s had their introduction to information technology. 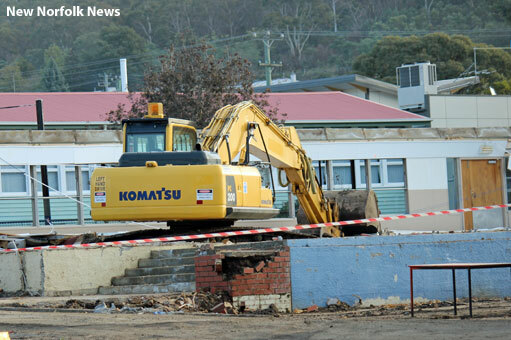 Other classrooms to be pulled down this week include the old typing and commerce rooms as well as the original main entrance, toilets, a staffroom, welfare office and the school nurse's rooms. These comprise the Bristol Block, a prefabricated aluminium building imported from England. In a note to parents last week, acting principal Anna Viney said extra precautions had been taken and students would be safe at all times while the works were being carried out. The school canteen will operate from the home economics room for two weeks. "This is an exciting time for the school as it will open up the grounds and enable a redevelopment of a very useful courtyard area for students," Ms Viney said. In addition to the demolition of the original 1954 buildings, significant upgrades are occurring in several parts of the school. This ranges from painting and the installation of new technologies in some areas, to the complete refurbishing of the Grade 7 block which was built in the late 1970s. 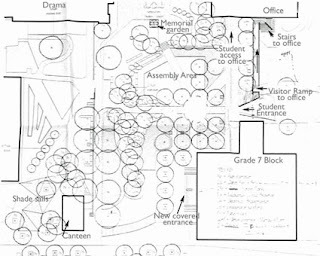 A sketch of how the landscaping may look. Thorough refurbishment of the Grade 7 block, including new windows, carpet, paint, doors, meeting and ICT facilities and a new entrance. 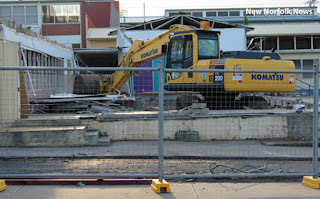 Demolition of buildings that are no longer required, based on current and projected enrolments. Civil works and landscaping of the front and central zones of the school, including an assembly courtyard and outdoor learning and recreation spaces. 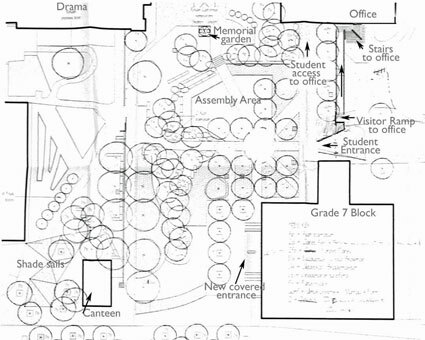 The Memorial Garden will stay in its current location and will frame one side of the new outdoor assembly stage. Many new trees, both for shade and visual attractiveness. New surfaces will include a combination of grass, concrete and compacted gravel, sandstone blocks and smooth boulders. A ramp to the front office. The majority of the works are scheduled to be completed during Term 2. Grade 7 students should be able to move in to their refurbished space in Term 3.